When I first took a look at this set up I thought "Holy Moly, how am I going to work all of this out," this is extremely complex. But when I sat back and read the labeling (which is well done), it is all very clear and well laid out. Anyone else with a "seemingly" complicated set up? Wow! That's my fists reaction. Question though. How many tanks are in the system? Two engines plus a generator? We're getting ready to redo ours so this is a timely thread. How are the labels attached? Smitty, that's nice and simple. You can see you have the starboard engine and gen running from and back to the starboard tank and the port to and from the port tank. Do you have any way of balancing the tanks, or do you just put more fuel into the starboard tank? I will take some closer photos later and explain the set up - it really is much simpler than it looks. "Do you have any way of balancing the tanks, or do you just put more fuel into the starboard tank?" These manifolds were the same on my last 3 boats so we got pretty used to them. Often balanced by just putting a bit more fuel in the tank used by the genset. Or we just rotated the selection of the genset tank as the valves were very handy to access - 20 hours or so port then 20 hours or so stb. Or if we had a tank imbalance just temporarily set both engines to return fuel to the lower tank until even then set them back to individual tank returns. Notably - the mains burned very near equal amounts over 10+ seasons as we used boost gages to syn engines at anything over hull speed. 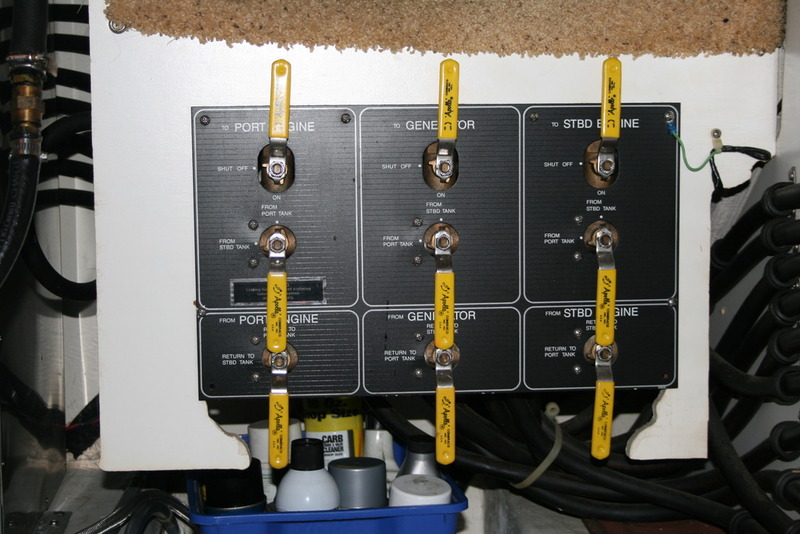 my system is so simple it does not require any valves except for a shut off for each engine/generator. One fuel pump to move fuel in either direction if need be (which is almost never). I've had boats with forward and reverse valves, and this one took me by suprise until I examined it closely. It is a marvel of simplicity, yet still providing the ability to balance fuel load. One fuel pump to move fuel in either direction if need be (which is never). Here are a couple of photos. The first one with red lines in the flow coming from the tanks and going to the engines. With a transfer line. The second one with yellow lines are the return flows coming back from the engines to the tanks, with a transfer line. Three tanks, Starboard, Port and Forward. Tags are on there with cable ties. I have 600+ of safe range at hull speed. What makes this system possible is my two engine, two tank setup. Each tank is 220 gallons, so 440 gallons total. If I had a single screw boast, or more than two tanks valving would of course be required. For a boat with two tanks, and twin engines I see no logical reason to make things more complex than necessary for reliable operation. As a interesting note the photos that Ron (smitty) posted are of the way the valves were arranged on this same model boat of previous model years. At some point the Bayliner engineering team figured out that it was unnecessary and went with a simpler system. So don't you have valves controlling where you want your fuel to be taken from and returned to? Or is it fixed that it feeds and returns to that same tank for each engine? There is a reversing fuel pump between the two tanks that can transfer fuel in either direction. Similar to Mr. ks. 3 tanks, 3 valves (each engine+genny). All tanks are amidships in the keel connected by 2 valves. No transfer pump(s). Simple, easy-peasy. Easy and elegant. Just lie on your side and it gets even easier. So you have to draw from both tanks at all times? What is the valve bottom left for? No, I can draw from either tank or both. If you look carefully at the diagram, you'll see that eack tank has a shut off at the tank itself. Both tanks feed the supply manifold. If you close the valve at the tank, only the other tank feeds the supply manifold. The valve at the bottom left is the starboard engine supply. Menzies, the photo is sideways and needs to be rotated clockwise. I think the valve you are referring to is the one in the shadows. That valve, if the picture was rotated would be on the upper left. It is the return line to the starboard tank. Replumbed my system during the refit. It's very simple. Engine and generator both draw off the starboard tank and each has their own shutoff valve and Racor separator. By practice, all fuel is pumped into the port tank. You could fill the starboard tank in an emergency. Fuel is transferred to the starboard tank through the fuel polisher. Plumbing is such that fuel can be transferred to either tank. Either tank can be polished. If the transfer pump fails, both suction valves can be opened to equalize the tanks by gravity. Each tank hold over 300 gallons for a total range of over 2,000 miles.